"Eye Opener" is dedicated to bringing news about new research, litigation filings and outcomes, medical advances, catastrophic injuries, and a multitude of other key issues in our fields of medical malpractice and catastrophic injury, which affect the lives of so many on a daily basis. Boating Accident:FL East Coast Boating Incident ends in multiple deaths! Cyril Holley, 46, and his daughter, Madison Holley, 19, were riding in a boat when they were struck and killed by another vessel, which was carrying other family and friends near Disappearing Island. Two other people were taken to nearby hospitals. 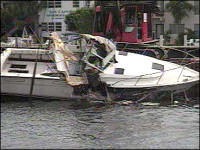 Witnesses told Local 6 that one of the boats appeared to jump over and crash on top of the victims’ watercraft. I will tell you from first-hand experience that the waterways and ocean along the east coast of Florida are packed with boats of varying sizes on any given Memorial Day Weekend. Ponce Inlet (where this horrible incident occurred), an area on Florida’s east coast just south of Daytona Beach, is an area known for its significant boat population. What makes this story even more tragic, is that Ms. Holley was due to give birth in two weeks, and the unborn child’s father was also on one of the two boats involved in the collision. Our thoughts are with the families who lost their loved ones. Brian Nash’s comment: For those of you who have been on our wonderful waterways of D.C. and Maryland, I would imagine you have your own tales of accidents and numerous near-misses. A year ago, I saw a father flying around the Bay in a speed boat in the shipping lane with his kids screaming for joy as they hung on for dear life in a plastic raft being towed behind. Jet skiers, drunks at the helm – they’re all out there. Enjoy the water, but for goodness sake, use some common sense. If you are a boater, you know how fast it can all go so wrong.